the sweeping revolution in technology and puts more emphasis on the reader as a health-care consumer. It also updates the information on the most prominent health issues of the nineties, including Alzheimer's disease, AIDS, chronic fatigue syndrome, stress, death and dying, drug abuse, and more. The book is divided into four sections for easy reference. Part I, "Your Healthy body," contains specific tips you can use for preventive self-care and encourages you to adopt a more healthy lifestyle, with advice on diet, exercise, losing weight, reducing stress, and stopping smoking. A full-color atlas of the human body shows you the location and name of almost every organ, nerve, bone, and muscle. Part II, "Symptoms and Self-Diagnosis," provides the clearest, most reliable aid for recognizing medical problems ever published for the layperson. Over 165 pages of unique diagnostic symptom charts with clear questions and yes/no answers will help you track down what a particular symptom may signify and advise you whether it is something you may safely treat yourself, a condition requiring a doctor's visit, or an emergency requiring immediate medical attention. Consistently voted the book's most popular feature by readers' polls, these charts alone can save you time and money by sparing you needless visits to the doctor. Full-color photographs, used in conjunction with the charts, will help you identify various conditions and decide when to seek medical advice. An all-new diagnostic imaging section introduces full-color images of ultrasound, Doppler, MRI, CT scans, and other technologies that are becoming commonplace in doctors' offices and hospitals. Part III, "Diseases, Disorders, and Other Problems," provides detailed, accessible, expertly illustrated articles on more than 650 medical problems. Separate sections address the special problems of men, women, couples, infants and children, adolescents, and older people, including a comprehensive section on pregnancy and childbirth. Part IV of the guide, "Caring for the Sick," covers all the basics of professional medical care, home nursing, and caregiving. You'll learn how to choose a personal physician, how to get the most out of your hospital's services, what your rights as a patient are, and how to cope with a sick child or older person or someone with a terminal illness. You'll also find a glossary of over 300 medical terms and a color-coded section on first aid that includes the most up-to-date CPR positions and other lifesaving information. The American Medical Association is committed to the principle that, as patients and health consumers, we need to do all we can to work more effectively with our physicians and health care teams. 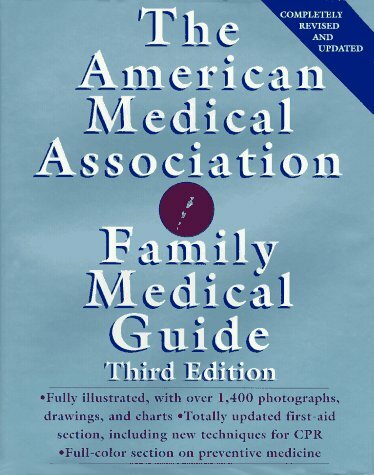 This third edition of the Family Medical Guide -- easy to understand, superbly designed, beautifully illustrated, and brimming with up-to-date information -- will help you and your family stay healthy and help you create an effective partnership with your doctor when you need it. It belongs on every family's reference shelf.